I have reviewed elsewhere evidence of the affect of genetic exchange not only on the origin of yeast lineages used in the production of various alcoholic beverages, but also on their adaptive evolution (Arnold 2006, pp. 120-121). Briefly, several lines of evidence support a significant role for both hybrid speciation and introgressive hybridization in the formation of the Saccharomyces species on which the production of beer, wine, ale, sake, and so on depends. In terms of hybrid lineage formation, the Saccharomyces cerevisiae genome is well-documented as having originated through a whole-genome duplication event that may or may not have involved allopolyploid speciation (Scannell et al. 2007). In addition, other species of yeast have been determined to be allopolyploid and thus hybrid species (Masneuf et al. 1998; de Barros Lopes et al. 2002). Finally, introgressive hybridization and horizontal transfer events have been inferred repeatedly for various Saccharomyces taxa (e.g., Groth et al. 1999; Liti et al. 2006; Hall and Dietrich 2007). As with the evolution of yeast lineages, the origin and evolutionary trajectory of Vitis vinifera, the grapevine, has to some extent been closely associated with human cultures. Though used for table grape and raisin production as well, this species is best known as the basis of the wine industry (This et al. 2006). The origin of winemaking, as an intentional human activity, is thought to have occurred sometime during the Neolithic (c.6,000-10,500 ybp) in the Near-East (McGovern and Hartung 1997; This et al. 2006). However, V. vinifera is one of ~60 species in the genus, with its origin timed at c.65 mya (Aradhya et al. 2003; This et al. 2006). The two subspecies recognized as the wild (sil-vestris or sylvestris) and cultivated (vinifera or sativa) forms of this species coexist in Eurasia and North Africa, with the wild progenitor being rare (Aradhya et al. 2003; Arroyo-García et al. 2006; This et al. 2006). The morphological/reproductive differences between the cultivated and wild lineages are significant and reflect human-mediated selection. The divergent characteristics include: (1) leaf shape; (2) seed shape and size; (3) hermaphroditic (male and female components present in the same flower) flowers in the cultivar, but sexes on separate flowers in the wild lineage; and (4) large, well-developed clusters of seeds in the cultivar that are not present in the wild silvestris plants (This et al. 2006). 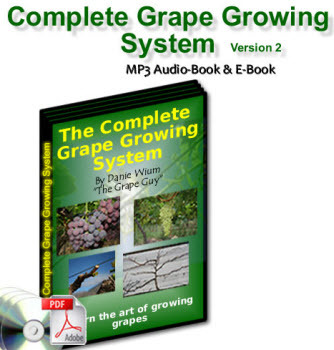 Both ancient polyploidy as well as contemporaneous introgressive hybridization has shaped the evolution of the grapevine genome. Jaillon et al. (2007) compared the genome sequence of a Pinot Noir-derivative genotype of V. vinifera to those of Arabidopsis, poplar and rice. This analysis resulted in the inference that three genomes had contributed to the grapevine cultivar—V. vinifera is a hexaploid (Figure 5.11). The polyploidy event(s) that resulted in the three genomes being brought together to form the hexaploid V. vinifera was determined to be ancient rather than recent (Figure 5.11; Jaillon et al. 2007). 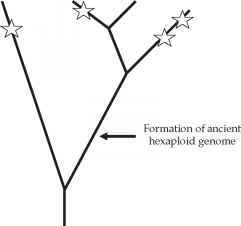 Whether or not the formation of the hexaploid occurred by a single step, or multiple steps, is not yet known. Regardless of the number of events, the origin of this polyploid derivative likely involved hybridization between divergent lineages. This inference derives from the observation that, for plant lineages, allopolyploid (hybrid) speciation occurs much more frequently than does autopolyploid speciation (see Stebbins 1947; Soltis et al. 2003). Figure 5.11 Polyploidy events associated with the evolution of the grapevine, V. vinifera. Genome sequencing of the grapevine and comparisons of its genome with those of rice, poplar, and Arabidopsis indicated an ancient hexaploid formation in the lineage leading to the three dicot taxa (i.e., poplar, grapevine, and Arabidopsis). The genome analyses also indicated a series of additional whole-genome duplication events along the lineages leading to rice, poplar, and Arabidopsis (each duplication event is indicated by a star; Jaillon et al. 2007). et al. (2003) reviewed data indicating that contact between the wild and cultivated grapevines had led to the establishment of "complex introgres-sive hybrid swarms in transitions zones"—zones located between the agricultural fields and natural settings. Indeed, this type of spontaneous introgression (i.e., not from controlled crosses by humans) was seen as a key factor in introducing the genetic variation that provided the material for the development of European V. vinifera cultivars (Bowers et al. 1999; Aradhya et al. 2003) and thus the basis of much of the present-day, worldwide, wine industry.